Often imitated, never equalled, this low budget ($325,000) masterpiece took all the suspense of Psycho and repackaged it in colour with teenage protagonists - a knowing nod to the market. Although credited with spawning the slash and gore pics of the 1980s, it contains relatively little blood, instead relying on shock and the unrelenting build up of suspense. Once again, the premise is simple – teenage babysitter tries to escape the attentions of a rampaging serial killer – but Carpenter's deft use of shadows and score (he composed it himself) made it horrifying and fresh, although subsequent over-use of its elements have turned them into clichés. There are many nods to Hitchcock, not least the casting of Jamie Lee Curtis (Janet Leigh's daughter in her screen debut) in the main role, coupled with the Herrmannesque string notes which signal the fatal blows of the killer's hand, and the sonorous explanations of Dr Loomis (Donald Pleasance), who is named after Sam Loomis, Marion Crane's lover. One of the great horror icons, Michael Myers is as primal and unreasoning a killer as Hitchcock's Birds, and just as deadly and inhuman. His white-masked face emerges from the shadows only slowly; he lurks (in the widescreen, DON'T watch the Pan & scan, he's missing half the time) on the edges, appearing as a shoulder, the back of a head, a half-glimpsed white flash until we have enough information about his past behaviour to be truly terrified for the characters onscreen. Those who are still left alive. It's worth noting that Myer's signature visage was a $2 William Shatner mask painted white by production designer Tommy Lee Wallace. John Carpenter took the story idea (tentatively entitled The Babysitter Murders) from Irwin Yablans, and, with producer Debra Hill, wrote the script in 10 days. The story is set in the small town of Haddonfield, Illinois, the kind of innocuous, everyday suburban setting that was to be revisited so successfully by the likes of Wes Craven, Sean Cunningham, Brian Yuzna and even Peter Jackson (with a NZ flavour) throughout the 1980s. Myers is the stuff of local legend; fifteen years previously he murdered his teenage sister, Judith, on Hallowe'en night, and has been incarcerated in an asylum since. 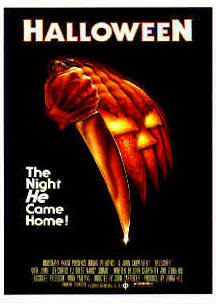 But now, as the tagline tells us, is "The Night HE Came Home", and hapless babysitter/virgin Laurie Strode (Jamie Lee Curtis) finds herself the unlucky target of his bloodlust. Much has been written about the character of Laurie Strode, one of the first Final Girls, those sole survivors (often because of her refusal to take part in sexual initiation rites) of the carnage, who overcome physical weakness and ineptitude to defeat the monster. Halloween establishes the formula for Final Girl behaviour, down to the slightly androgynous appearance, the "less popular virgin" status, and the 'kicker' - that re-appearance of the monster when the Final Girl thinks she has polished him (it's always a him) off. The Final Girl can represent a patriarchal construct (the manipulated and persecuted virgin-victim who triumphs through purity and passivity, often winning by accident) or a feminist heroine, defeating the misogynist monster who would penetrate her with his blade(s). Halloween II (1981) A direct continuation of the events of the first movie - while Laurie recovers in hospital, a bullet-laden Myers continues his killing spree around Haddonfield, chased by Dr Loomis & sundry cops. Halloween IV: The Return of Michael Myers (1988) Michael, who has been catatonic for ten years (perhaps explaining his absence from III) wakes up, kills everyone, and lays siege to Haddonfield on (of course) Halloween, killing most of the police force in an attempt to get to his 7 year old niece, Jamie. Only Dr Loomis can save the day. Halloween V: The Revenge of Michael Myers (1989) One year later, it's the end of the 1980s, and horror audiences demand horny teens, silly music and a sense of slapstick when cops pursue the killer. Dr Loomis is still there, and Jamie discovers her psychic link with Michael, whose modus operandi remains the same. Halloween VI: The Curse of Michael Myers (1995) It turns out that Michael is a victim of a curse that makes him seek out and kill his family members (who knew?). When Jamie gives birth to a baby, and then abandons it, crazy Dr Wynn figures the child is the ultimate way to lure Michael into the open. Halloween: H20 (1998) In a post-Scream world (the original treatment was written by Kevin Williamson and he exec produced), this entry ignores the events of 3-6 and brings us back to Laurie (the return of Jamie Lee), now headmistress of a private school. Still haunted by past events she must now protect her 17 year old son (Josh Hartnett) from the murderous Michael. Plenty of hommage to the original. Halloween: Resurrection (2002) Scholarship cash persuades a group of Haddonfield students to spend the night in the Myers' family home. You know the rest. Halloween (2007) Rob Zombie's remake. Halloween II (2009) Another Rob Zombie remake.